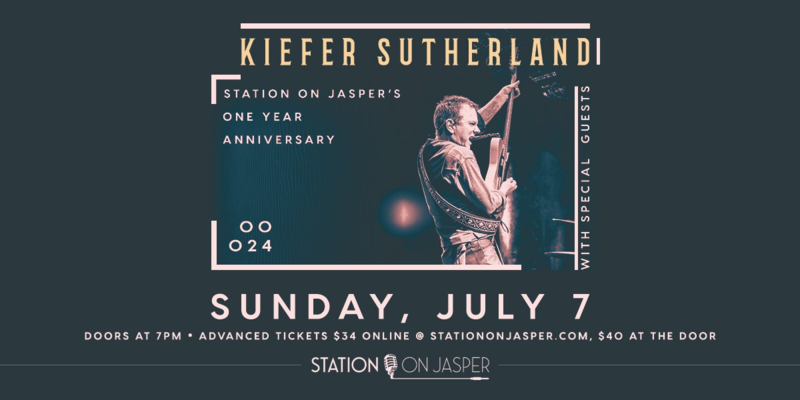 Kiefer Sutherland, whose “unexpected, unvarnished authenticity as a singer/songwriter” (Associated Press) and “edgy vocals blended with passion” (Rolling Stone) is performing at Station on Jasper as part of our First Anniversary Birthday Weekend! Sutherland's primary motivation as an artist is the thrill of forging that connection with his audience through the music. “I couldn’t have imagined the depth with which I have fallen in love with touring. To have the opportunity to convey intimate, personal stories to an audience, for me, has proven to be priceless,” Kiefer said. Experience his passionate performance live on July 7th. Doors at 7. Tickets are $34 available for purchase online or at the venue.